Nine months of pregnancy is a special journey that should be experienced in style. Just because your body is changing, doesn’t mean you can’t be a trendsetter. I had the opportunity to check out the Thyme Maternity line as they get ready to launch their ‘must-haves’ at Babies “R” Us, and it is gorgeous. TAKE ADVANTAGE OF THIS SPECIAL!!!!!!!! Thyme Maternity has expectant moms covered with denim jeans, work pants, dresses, blouses and sweaters, pajamas, tights, nursing bras, underwear, and a wide selection of body lotions. Celebrating every color of the rainbow, the collection is bright, fashionable, and most importantly, comfortable. I couldn’t stop rubbing my hand over the mannequins’ bellies because the fabric was so soft. The designers at Thyme aim to deliver quality products that support women during this precious time, while delivering them dazzling looks that will leave the non-bump girls envious. The line is extremely versatile, as it caters to every occasion, each step of the pregnancy. From the first trimester to the “fourth” (post-baby), Thyme Maternity has it all. Paired with delicate comfort and great form, that radiant mom-to-be glow will shine even brighter in these essential fashions. I definitely recommend checking out the pajamas- some of them even come with an adorable matching onesie for when the baby makes their debut! 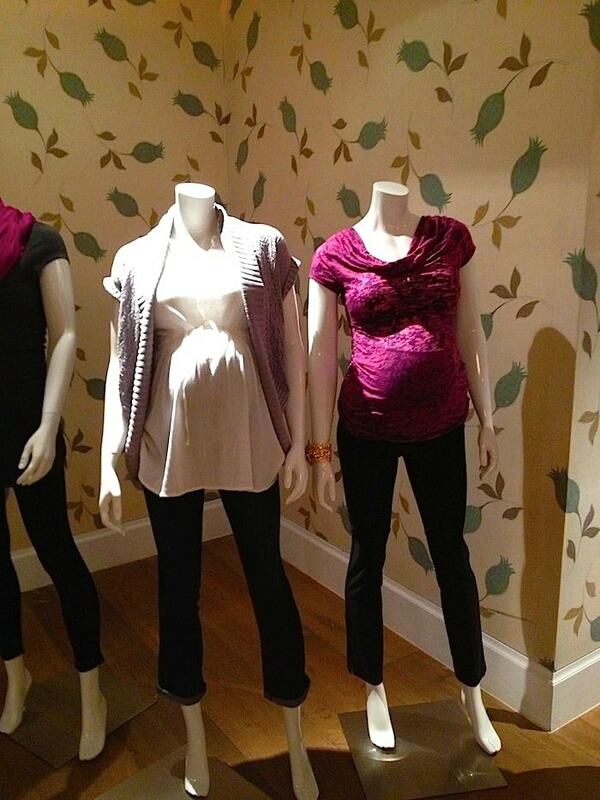 The Thyme Maternity collection is available exclusively at Babies “R” Us. I would definitely recommend picking up their informative (and free) Mom-To-Be Checklist. It’s a great resource that guides you through every stage of this exciting journey. Grand opening event in all Thyme shop in shops within Babies“R”Us stores January 26 and 27 – door crashers while quantities last – first 50 people in each Thyme shop in shop will get a $20 savings pass to be used on Thyme merchandise. Valid that weekend only! Maternity clothes are always so cute when I’m NOT pregnant (which I never will be again). When I was I couldn’t find a thing to wear! I was seriously about to say the exact same thing. Gah! Oh girl, this line is making me wish I was pregnant. Man seeing these maternity clothes makes me wish I was pregnant again. I had the most plain jane maternity clothes. I really love the flower top with the blue scarf. I was just pregnant and I’m pretty sure the options have gotten better even in the last 7 months. I really wish I had this line of clothing to buy from 2 years ago. They are beautiful! I worked in an office when I was expecting and these would have gone perfectly with the dress code. Maternity clothing has gotten SO MUCH more cute since I was wearing it. I love these styles.